For some, Ethiopia conjures images of famine and extreme poverty. I see a completely different picture. Ethiopia is a country rich in opportunity and resources, composed of hardworking men and women with innovative ideas and entrepreneurial spirits. However, agricultural technology and best business practices are not widely available or utilized. Women are also not fully empowered to make financial decisions for their families and struggle to own land or access credit. 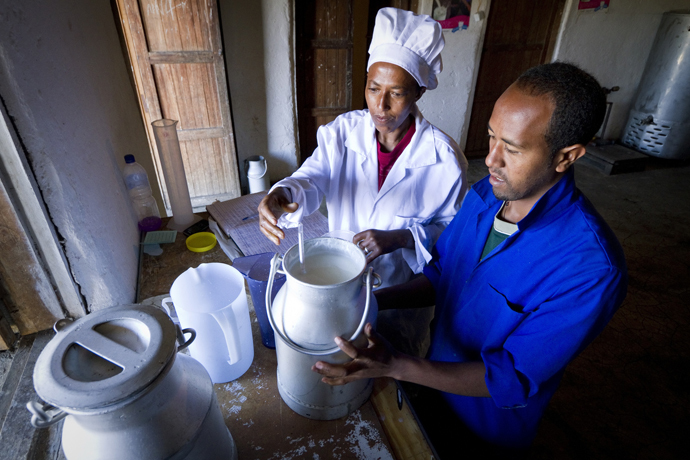 Ethiopia’s dairy sector is dominated by smallholder farmers caring for dairy cows. Processing milk is traditionally viewed as women’s work. Recently, Ethiopian women have turned this traditional role into an economic opportunity based on the training and financial assistance provided by USAID. 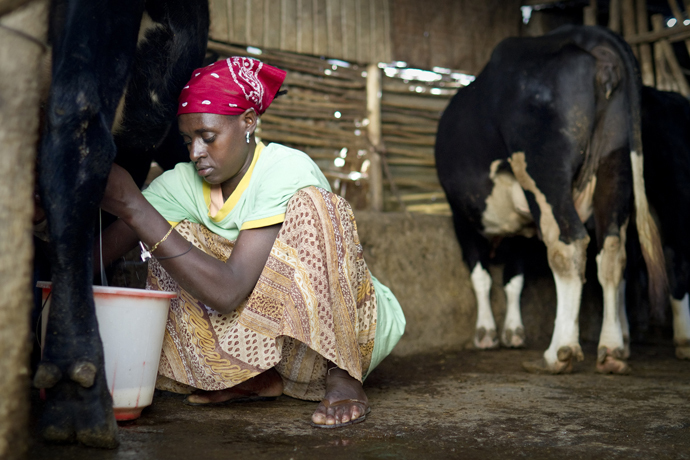 Livestock fattening and dairy production are areas that employ women. However, in most parts of Ethiopia, a lack of training and knowledge has prevented women from taking on leadership roles. As part of the U.S. Government’s Feed the Future initiative, the USAID Agricultural Growth Program-Livestock Market Development project seeks to improve nutrition and boost incomes, through training and investments in commodities like dairy, meat, and live animals. The project targets both men and women, with specific interventions to integrate women entrepreneurs into the broader livestock value chain. For example, the project developed a specific female entrepreneur training package designed to enhance the business capacity of women. Moreover, to better facilitate the participation of women in the offered technical trainings, the project provides innovative daycare services for the children of women participants. One of the project’s key objectives is to strengthen local Ethiopian organizations and help them build effective, long-term partnerships. In June 2013, USAID signed an agreement with Project Mercy; a local, faith-based not-for-profit relief and development agency established by Marta Gabre-Tsadick, the first woman senator of Ethiopia. Through the agreement, USAID is assisting with an innovative cattle cross-breeding program. The local cattle – when crossed with Jersey breed bulls, create offspring that are up to ten times more productive. The project specifically assisted input suppliers’ import of Jersey Cattle inputs to Ethiopia. A year and a half into its five-year time frame, this project is achieving significant results To empower women, the projecthas launched various training and technical assistance programs, including a leadership program and grants for female entrepreneurs. More than 100 rural women were trained in entrepreneurship and leadership during one 2013 session. These women now serve as business role models in livestock market development in their communities. Hirut Yohannes embodies the entrepreneurial spirit I see in so many Ethiopian women. In 2008, she launched Rut and Hirut Dairy, a milk processing company located in Cha Cha, Amhara, just outside Addis Ababa. After some initial successes, she wanted to expand her company’s operations but needed guidance. Hirut approached USAID for support and was trained in production and marketing of quality products. She learned to make higher quality gouda and mozzarella cheese, flavored yogurt, cream cheese, and several other types of cheese. USAID also assisted Hirut to introduce packaging for fluid milk products. Following support from the project, Rut and Hirut Dairy saw an almost immediate 50 percent increase in sales, which enabled Hirut to increase the volume of milk she purchases from farmers and to increase its sale price by 12 percent per liter. Hirut now provides market access for more farmers in her area and has plans to establish new milk collection centers to further expand her business. With higher quality products, she has increased her income and profitability and is now able to service the bank loan that she had accessed to originally establish her milk processing facility. Extreme poverty is still a serious problem in many parts of Ethiopia. Projects like this, however, are providing sustainable solutions to some of the most intractable issues that Ethiopians face. Successful women entrepreneurs serve as role models for other women who see little opportunity to improve their family’s income. While the role models are the ones that inspire other women to initiate and expand their livestock businesses, USAID provides essential training and support to help their endeavors succeed. Watch a video to learn more about USAID’s partnership with Project Mercy. Learn more about Hirut’s story.